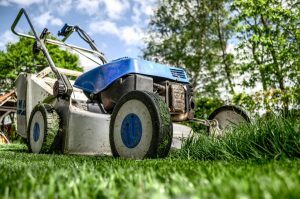 Depending on the type of grass you have, cutting lengths will differ by season. That said, the idea is the same for all grasses. During their growing season, keep your mower higher off the ground! Yards can be all shapes and sizes, with grass getting all kinds of different sunlight. Grass growing under shady trees should be mowed a little higher than grass in direct sunlight. There are two types of growing patterns for grass: cool-season and warm-season. As you know, some of the most common types of grass in Georgia are Bermuda and St. Augustine. Both of these grasses are warm-season growers, so their peak growth occurs in the summer. Bermuda grass should be kept between .5-2.5 inches, while St. Augustin is a little taller and should be kept from 1-3 inches. Depending on your yard type, there may be many other factors to consider when moving your lawn. Our experienced lawn team have seen it all, and will take care of everything with one of our maintenance lawn plans. Just leave it to us!